To test the severity of a viral infection, clinicians try to gauge how many viruses are packed into a certain volume of blood or other bodily fluid. This measurement, called viral load, helps doctors diagnose or monitor chronic viral diseases such as HIV/AIDS and hepatitis. However, the standard methods used for these tests are only able to estimate the number of viruses in a given volume of fluid. Now two independent teams have developed new optics-based methods for determining the exact viral load of a sample by counting individual virus particles. These new methods are faster and cheaper than standard tests and they offer the potential to conduct the measurements in a medical office or hospital instead of a laboratory. The teams will present their latest results at the Conference on Lasers and Electro-Optics (CLEO: 2013), to be held June 9-14, in San Jose, Calif.
One research group, led by electrical engineer and bioengineer Aydogan Ozcan of UCLA, is working to directly image single virus particles using holographic microscopy. 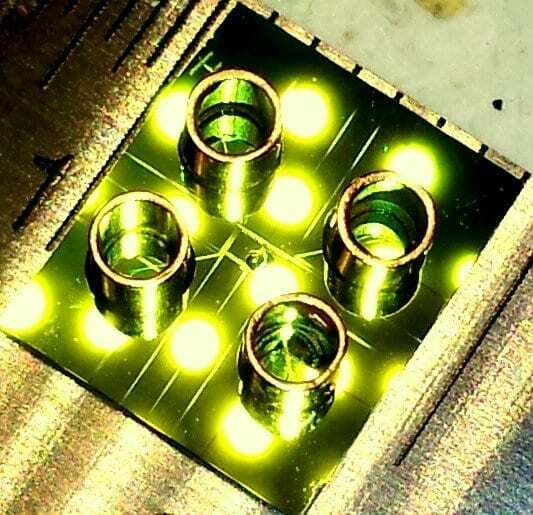 The other, led by electrical engineer Holger Schmidt of the University of California, Santa Cruz (UCSC), is detecting single particles tagged with fluorescent labels on a microfluidic chip. Both teams expect to use their work to develop commercial instruments useful for on-site diagnosis and monitoring with rapid results and fast turnaround. Ozcan’s UCLA team has demonstrated the ability to capture optical images of single viruses and nanoparticles over a comparatively large field of view – about the size of a postage stamp – using nanolenses that self-assemble around the virus particles like little magnifying glasses. “Because viruses are very small–less than 100 billionths of a meter–compared to the wavelength of light, conventional light microscopy has difficulty producing an image due to weak scattering of sub-wavelength particles,” Ozcan says. When lighted, the team’s new nanolens-nanoparticle assembly projects a hologram that can be recorded using a CMOS imager chip (a type of semiconductor-based light detector) and digitally reconstructed to form an optical image of the particle. “The resulting image improves the field-of-view of a conventional optical microscope by two orders of magnitude,” says Ozcan. This wide field of view allows the device to form images of many nanoparticles in a single photograph and provides a high-throughput platform for a direct and accurate viral load count. The instrument can be made sufficiently compact and lightweight for field applications and, attached to a cell phone, could become useful even in remote locations.